Bandages, high quality, low priced, ships free over $50. 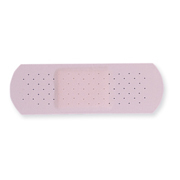 Choose from a large selection of band-aids, latex free adhesive bandages, plastic bandages, blue bandages, butterfly bandages,and even blue finger cot bandage protectors at low prices. Flexible Heavy Weight Bandages conform to the body to cushion and protect cuts and scrapes without sticking to them. Our heavy weight bandages are available in 7/8" x 3", 7/8" x 1 1/2", Knuckle Bandages, Fingertip Bandages and Large Patch Bandages. Our Blue High Visibility bandages (hi-vis blue band aids) are made of a heavy weight fabric and are ideal for the food preparation industry. These Food Prep Band-Aids offer instant recognition in case of loss during food processing or preparation. 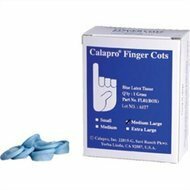 We offer our Hi Vis Blue Bandages in 1"x3" Strips Band Aids, Hi Vis Blue Fingertip Bandages, Hi Vis Blue Knuckle Bandages and Hi Vis Blue Finger Cots to meet all of your bandage needs. We also carry skin tone latex free bandages. SEE ALL FIRST AID SUPPLIES HERE ! Our selection of high quality first aid bandages will meet the needs of any workplace. 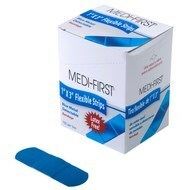 All of our Medi First Plus Bandages are latex free. Our fabric bandages are made of a heavy woven fabric with strong adhesive to help them stay put even in the harshest conditions. These first aid bandages stay on even in water or grease. The non- stick pad and ventilation promote healing of the wound. 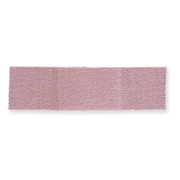 Choose from many different styles and shapes to meet the needs of different injuries such as traditional 7/8" x 3" strip bandage, fingertip bandage, knuckle bandage, large patch bandage and the popular small junior strip bandage. We also offer a nice selection of Hi Vis Blue Bandages that were created for use in food and restaurant prep locations. These Hi Vis Blue Bandages are made of the same heavy woven fabric and strong adhesives as our regular bandages.